Finding the right wedding photographer(s) is one of the most important decisions you will make for your destination wedding. So many people are unhappy with their wedding photos, you will want to pay extra attention to how you pick the person who will document your special day. Here are some tips from my experience. So, you’re having a destination wedding. After the initial euphoria about how amazing your dream wedding is going to be, you start thinking about the zillion things you have to do, and the fact that it will be even harder than a wedding near home because you are doing almost everything remotely. You are not going to meet any of the people who are going to make your wedding a reality. You are going to be signing contracts and emailing them back without truly knowing if your expectations and your vendor’s expectations are on the same page. Perhaps you are in NYC and your wedding is on a tropical island where they might not work with the same efficiency you’re used to. Or perhaps your wedding is in a country with a completely different culture where everything gets lost in translation. Although I can’t help you with most of your potential roadblocks, I can give you tips on one of the most important decisions you have to make—finding the right wedding photographer—based on my experience. Our first consideration was the budget for photo and video. We decided that for our wedding, we were going to indulge ourselves with cameras while trying to keep to a somewhat reasonable budget (under $4,000): part of it for a video team complete with a drone to record from the air, and the rest of it to capture moments in still photos. We spent a lot of time searching for photographers on Google, Wedding Wire, and reading Yelp reviews when available. For all the photographers we found, we thoroughly went through their websites and blogs and came up with a list of our top 10 choices. We contacted all of them to get a feel for their personality. Fortunately, our top 3 were all available for our dates. The first had an absolutely amazing portfolio with a slight ethereal quality to her photos, was great on the telephone, and we got a great professional vibe from her. Her prices were on the upper end (and slightly above) what we had budgeted. The second photographer also used gentle contrasts in his work with a slight Instagram kind of feel, and produced generally nice work. His personality seemed to have a bit of that island relaxedness. He mentioned that he’d photographed hundreds weddings, but also had another full-time job. The third photographer’s style was quite different from the first two—much stronger contrast with amazing sunset backdrops. He really knew how to manipulate light. How many weddings have you done? Do you photograph weddings full-time? How much will you charge for X hours? How many photos will you provide us? What additional locations would you suggest going to? Based on what we had established for our budget, the choice came down to either going slightly over with photographer number 1, or going with photographer number 2 and saving a little bit of money. We went with option number 2, but we only booked him for 5 hours on the wedding day so that we could also hire photographer number 3 for another photoshoot the day after the wedding. Photographer number 3 took such amazing nature photos that we couldn’t pass up the opportunity of being human props in his landscapes. This way, we chose two styles of photography to make both me and her happy—I love nature photography, and she likes slightly ethereal photos. So, for our audio/visual self-indulgence, we had a whole video team complete with video drone for the wedding, one photographer for the wedding, and one photographer the day after the wedding. These are a few key points we discussed after the big day, but before we received any photos or videos. Video team was very professional and really seemed to know what they were doing. The team had several people with cameras and microphones to capture the audio/video. The wedding day photographer did not provide much direction or feedback on our poses and facial expressions. He did spend some extra time with us and take us to an extra location which was nice. The ‘trash the dress’ day after photographer was very professional and great. He gave us a helpful amount of direction and had extra portable lighting for the sunset shoot. He only photographed us in one location instead of the two that were planned, but the location had beautiful scenery. The wedding video was beautiful. The video quality and editing were very nice. They seamlessly panned through multiple camera angles and incorporated short clips taken with the drone at the beginning and end of our video. Amazing value for the cost. Grade: 9/10. When we received our wedding day photos, we were happy with the variety of locations, but a little disappointed overall. Many photos did not have a sharp focus and seemed to be over-exposed. Also, the photos were 10 megapixels. For most purposes that is perfectly fine, but 10 megapixels is not ideal if you want to get giant professional prints. Grade: 7/10. The ‘trash the dress’ photos were really great. We got a handful of photos that we absolutely completely love, and many others that are great. Almost every photo looks like it is an HDR landscape where we are nature’s human accessories. This shoot was expensive, and a long drive, but most definitely worth it. We’ve already made extra large prints for our wall. (See above image for an example.) Grade: 9/10. After getting over our mild disappointment over the wedding day photos, I wondered if he just processed them in a way that was too Instagram-y for our taste. I picked a couple dozen of our favorite shots, and politely asked him if he could send me the RAW files. He was very nice and did send me the photos I requested and, well, eureka! The lighting wasn’t ideal that day, but I was able to improve the pictures with increased sharpness, more accurate color temperature, and most importantly, reduce the over-exposure (see above image for an example). I believe that he put our photos through an automated processor that had trouble with the lighting conditions that day. Because I know how to manipulate RAW files, I was able to edit the images more to our liking. The lesson for us was that if we had to do it again, we’d try to ensure the photographer set away enough time to do the processing. The positives: he sent us more photos than we contracted for, and he did send me a couple dozen RAW files when I politely asked him. Since he took tons of photos, it gave us a wide variety of options and poses. Furthermore, his cost was within our budget and allowed us to get a ‘trash the dress’ photographer the next day. So, even though he didn’t provide us with the amount of direction we would have liked and the pictures did not meet our expectations at first, we had a generally good experience that I’d score a 7/10. What is your style of direction? Are you more hands-off or do you like to direct shots? How much time do you usually spend processing the RAW images? Are the photos on your blog representative of photos that needed a lot of work, or were you able to get them with your default settings? With respect to overall experience, we were very happy. In the end, everything is an educated guess and sunlight has a big role to play in an outdoor shoot. Regardless of who you pick, as long as you do at least a little bit of homework, you should end up with beautiful images of your special day. Good luck! Thank you! 🙂 And yeah, by month 3 we were definitely getting anxious! 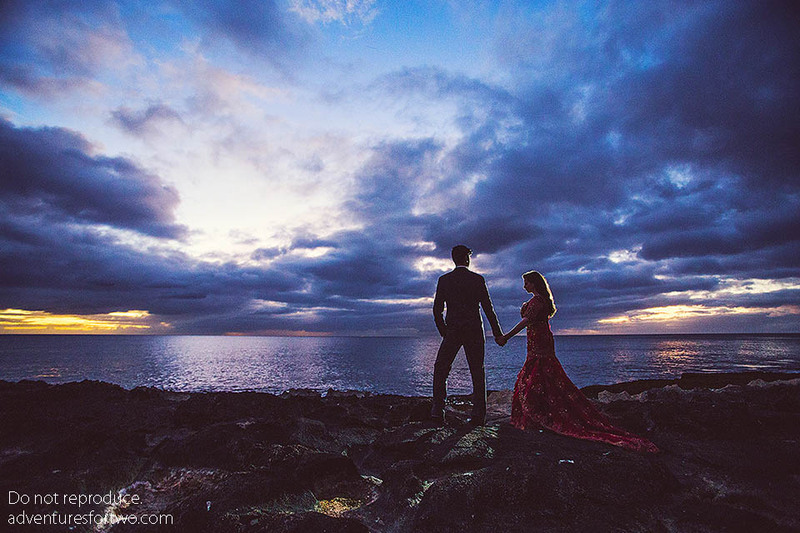 Reblogged this on Wed Aloha- Professional Wedding Planer. But your picture is quite beautiful ! Thanks! We got very lucky. We were so happy we chose two photographers with different styles.